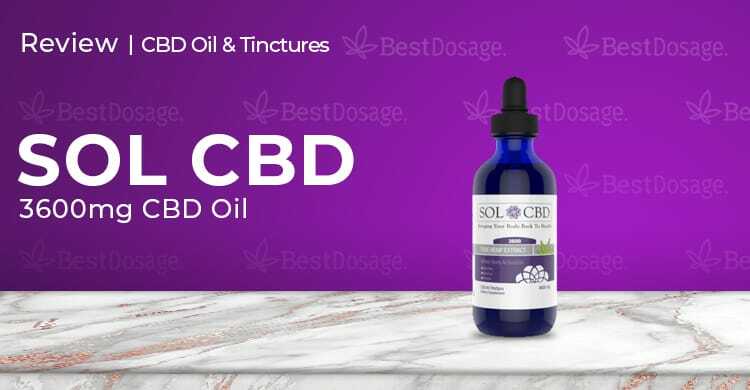 We really like SOL CBD tincture as a long-term solution for an everyday CBD user that needs something to deal with pain, anxiety or a sleeping disorder. Perhaps it’s the Ayurvedic approach that makes the SOL CBD tincture stand out among the many products on the market. Whatever it is, their tincture has become one of our favorite products and we’re sure you’ll love it too. With their 60-day money back guarantee, there’s no risk involved in trying it out. Today’s review is of the SOL CBD 3600mg CBD Oil Tincture. SOL CBD is one of the most popular CBD brands on Facebook and Instagram. With such a big following, I had to see what all the fuss was about. The owners of SOL CBD are health and natural product aficionados. Their unique advantage is in their expertise. Coming from 8+ years of work in the health sector, SOL founders Larry and Oksana Ostrovsky offer an experienced product with experienced knowledge. All of the SOL CBD tinctures and other products contain testing documentation and are 100% hemp derived and legal in the united states and most countries around the world. Even better, all of their products are backed by a 60-day no questions asked money back guarantee. 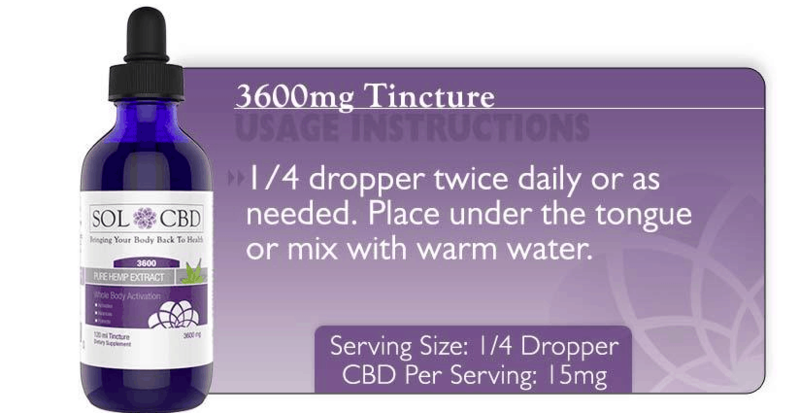 The SOL CBD tincture 3600mg bottle is good for 240 servings. It offers 15mg of CBD and 50mg of Hemp oil (stems and stalks) per serving. There are only 3 ingredients: Hemp Oil, CBD and MCT oil from the coconut. But that doesn’t tell the full story, because Sol CBD is a hemp-derived, C02 extract tincture that features a proprietary blend of water-soluble ayurvedic herbs in addition to cannabidiol. Ayurvedic medicine is an ancient Indian practice, and you might say that this SOL’s secret sauce. A little more info about MCT oil: Medium Chain Triglycerides or MCT are fats that are naturally found in coconut oil and are the easiest of fat chains for humans to utilize. Not only MCT adds additional health benefits, but it also improves the bioavailability of CBD. The first thing we noticed with the 3600mg SOL CBD bottle was its natural supplement look. The white labeling and dark blue bottle is durable, sleek and informative. The bottle clearly states dosage, ingredients, company story, and benefits. Clarity is undervalued, having a bottle that is you can understand should be one of your filters when choosing a CBD oil. The dropper only needs to be filled up a quarter of the way to reach a single serving. The bulb on the dropper is easy to squeeze, making the oil easy to draw up and release. The oil itself has little to no smell, and the flavor I tasted was a very light green tea. No aftertaste and flavor doesn’t get old. SOL CBD recommends that you consume 2 servings daily, or 30mg of CBD. However, if you read the reviews and or take the oil yourself, you’ll see that the sweet spot is closer to 40-50mg daily. This, of course, depends on what you are using CBD to treat too. Based on our experience with SOL, the best time of day to consume is typically morning, with the exception being for someone that needs CBD for insomnia or a different sleeping disorder. This CO2 extracted tincture sets in fast and lasts for a few hours. Some of the most common benefits are: boosted immune function, reduction in inflammation, improves your quality of sleep, optimize brain health, and lower anxiety. After administering the tincture via sublingual ingestion you should expect to feel the oil’s effects within 25 minutes. You won’t feel an intense relief, but your body will definitely feel relief from your ailments. The oil typically lasts for a few hours. SOL CBD can be reached via email or on social media: Facebook, Instagram, and Twitter. One of the major benefits of SOL CBD is their customer support. You can conveniently contact them on any of the social platforms, and their team will get back to you swiftly. All orders over $80 get free shipping. If your order is less than that, you will be charged $5.95 for shipping. Their primary shipping service is USPS Priority mail that also provides a tracking number. It usually takes 1-3 business days from coast-to-coast (orders shipped to Hawaii might take up to 7 business days). $327.00 for 240 servings. $1.36/day for 2 servings or 60mg of CBD. The high powered SOL CBD tincture 3600mg is one of my favorite CBD products. Why? The bottle doesn’t have to be replaced monthly, and the dosage per serving is higher and very affordable. It may be a bigger initial cost, but with 240 servings per bottle, it offers the most efficient way to consume CBD for an extended period of time. We really like SOL CBD tincture as a long-term solution for an everyday CBD user that needs something to deal with pain, anxiety or a sleeping disorder. Perhaps it’s the Ayurvedic approach that makes the SOL CBD tincture stand out among the many products on the market. Whatever it is, their tincture has become one of our favorite products and we’re sure you’ll love it too. With their 60-day money back guarantee, there’s no risk involved in trying it out.